Google AdSense Monitor: Since launching in the first half 2003, Google AdSense has had a big impact on affiliate marketing. Primarily, it has taken over lots of Web site real estate that was formerly going to affiliate programs. If you are not familiar with AdSense, it delivers relevant ads that are precisely targeted on a page-by-page basis to the content people find on your site. You can get AdSense ads in eleven different sizes, and make customizations to make them fit in with the color scheme of your site. Page Rank Search: One of the burning issues for affiliates is their Google Page Rank, as well as the Page Rank for other sites for potential link exchanges. If you are not familiar with Page Rank, it is a numeric value that represents the relative importance of a site on the Internet. Well, in the world according to Google, anyway. The way it works is that when a site links to another site, Google sees this as a sort of vote for that other site. Stop Traffic Leaks: If you own your own domain, there are some common typos that can be stripping traffic from your site. When people are typing in your domain(s), it's common for them to only type two W's or an extra W before the dot. And there are also plenty of folks that type the three W's, but accidentally don't type a dot before the domain name. Write Content: One of the most effective ways to display affiliate links is to incorporate them into relevant content. This sort of contextual affiliate content can come in many shapes and forms, such as testimonials, reviews, and articles targeting a certain demographic. Pen is Mightier Than Web: We get a bit one dimensional with the way we promote affiliate sites at times. Sure, affiliates come in all shapes and sizes. You've got pay per click search engine arbitrage players, coupon/rebate sites, reward/loyalty sites, search engine optimizers, comparison shopping sites, content sites, e-mailers, data-feed sites, and blogs. Get IM Opt-ins: You've got an email newsletter and you're gathering email addresses from folks that want to hear from you. But that's not enough. While you have the attention of these people, make a pitch for more information. More specifically, ask them for their instant messager name, so you can send them special updates, deals, news or whatever. New Breed of Pop-Ups: Pop-ups are finished, right? Well, that's sort of right. The old school pops have been sufficiently thwarted by the various pop-up blockers, but just as the big companies create a blocker, the evil genuiuses devise a workaround. And guess what, there's a bit of a pop-up renaissance. The reason is that most pop-ups have been killed, and only the slick ones are breaking through. The signal to noise ratio is way down and the effectiveness of pops is climbing. TrackBack to Relevant Blogs: If you are currently blogging, you should also be utilizing the TrackBack feature to drive targeted traffic back to your site. There seems to be confusion among many bloggers about TrackBacks - how to do it, what it is, etc. Bascially, the TrackBack is a system implemented by many blogging tools that allows a blogger to see who has seen one of their posts and written another entry concerning it. Confuse the Spambots: One of the biggest productivity killers is email Spam. It's gotten to the point where a lot of sites just don't list their emails address anymore for people to contact them for more information. If you're doing this, you're cutting off potential business. There are alternatives to beat the Spammers, and still make it so people can reach you. 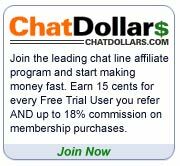 Affiliate Scripts from c3scripts.com: Affiliates are always looking for tools to increase their affiliate sales. One set of tools that all affiliates should try out are the scripts from c3scripts.com. You can integrate these affiliate scripts into your existing website or use them to create standalone websites.